Alton Tan questions PAP MP on transport system. How “public” is S’pore’s public transportation system? The following was sent to TOC by Mr Alton Tan. It is a reply to PAP MP, Dr Lam Pin Min, on the P65 blog. TOC thanks Mr Tan for allowing us to re-publish it here. I refer to the article, “New formula for public transport fare revision to be out this week” (The Straits Times, 1 July 2008). More ERP gantries, higher ERP charges. Taxi surcharges have gone up, and taxi companies may be implementing a fuel charge soon. The latest news? Fares on public transport will be increased. 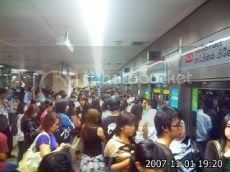 I sometimes really wonder how “public” is Singapore’s public transportation system. They are private companies with management who only focus on profits, profits, and more profits. Let me quote you an example. A few years ago when the North East line (NEL) was officially opened, several bus services going towards the city were terminated from my area. These services were basically from the Serangoon and Hougang depots (e.g. 111, 106, 501, 502 etc), reason being it wasn’t profitable to run these bus services along the same route as the NEL. Why? 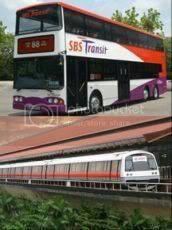 The NEL is owned by SBS Transit. But removing these services adversely affected those people who do not live near a NEL station. Travelling to Shenton Way or Orchard Road used to be just a 15-25 minute ride away from my house (I live along Boundary Road/Ang Mo Kio Ave 1) with express bus services 501/502. Now, it takes me 45-60 minutes to hop on a bus and switch to a train to get to town. Would you now rather drive or take a bus? If 501/502 were still serving the Boundary Road stretch, I would gladly take them. It would only be a 20 minute ride along the expressway. I have a simple question to ask: wouldn’t these bus services ease the heavy crowds on trains and other bus services if they were reinstated? Is the Public Transport Council trying to improve the public transportation system, or is it thinking of profits for the public transport companies only? With the inflation rate at an all-time high and still rising, raising public transport fares now will be a big blow to low/middle income families. Will the Government only finally step in when low/middle income citizens resort to bicycles as a form of transportation and public transport becomes nothing but a luxury for the poor? Will cars, trains and buses be restricted to only the rich and higher income families? Maybe one day roads in Singapore will be for cars only and only one lane on the road will be allocated to citizens’ vehicles and public buses because only the elite can afford to drive. I am writing this because I really feel for lower income families. I am currently working part time as I will be leaving to go overseas to further my studies soon. I currently only earn $1200/mth and after deducting CPF, I am left with $1000. After deducting my daily expenses and bills, I am left with $400. I really salute those low-income families who can raise a family with a pay similar to mine (and I am only supporting myself). I hope that in 2010 when I return to Singapore, I will not see more beggars on the street begging for money, or senior citizens stalking tables at hawker centres collecting empty drink cans or cardboard.